Spread some cheer with Houdini Blanc de Noir vintage champagne made from pinot noir with some chardonnay for balance and lemon brightness; aromas and flavors of strawberry and raspberry lead to a crisp, balanced finish. 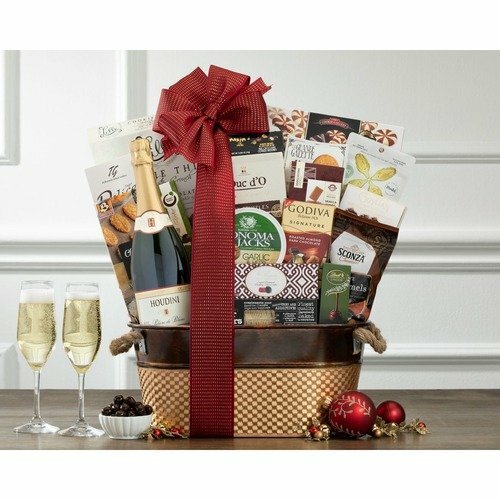 An enticing selection of Godiva hazelnut milk chocolate, crackers, smoked salmon, cheese, truffles, butter cookies and much more completes this celebration. * Great selection and easy to order online. * Easy site to browse and purchase on line. Very competitive prices! 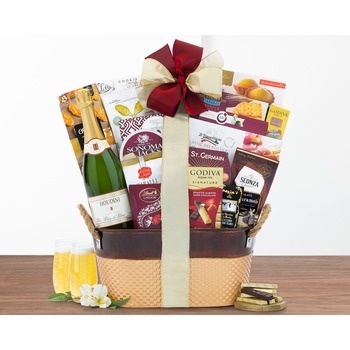 * Extremely helpful to send a beautiful gift to friends and family around the world.